Samsung's Galaxy Note 8 has a 6.3in screen and a headphone jack | What Hi-Fi? The biggest Note screen to date, dual 12-megapixel rear cameras, a headphone jack and - fingers crossed - a battery that won’t explode. After the Galaxy Note 7 infamously went out with a literal bang – several caught fire due to battery faults – Samsung is looking to start its Huge Screen range afresh with its successor, the Galaxy Note 8. Samsung’s latest Galaxy Unpacked event began by requesting people take a “forgive and forget” approach to previous issues, before confirming the official details for the much-rumoured new Note phone. We’ll start big: the screen. The Galaxy Note 8 features a huge 6.3in QHD+ Super AMOLED Infinity display – a fair bit larger than its predecessor’s 5.7in 2K AMOLED screen and the biggest-ever screen in a Note handset. You can take advantage of that super-size canvas with the new S Pen stylus – one of the Note range’s trademark features – which promises to be “smarter and more precise” thanks, in part, to a finer tip. A great deal of emphasis was directed to the Note 8’s camera – and with good reason. “Twice as good as before” and the "best-performing camera" yet, it features a dual 12MP rear camera: a f/2.4 telephoto lens with autofocus, and a f/1.7 wide-angle lens. Meanwhile, the front camera is an 8MP f/1.7 lens with autofocus. Samsung claims the Note 8 is the first smartphone to have image stabilisation in both cameras. Unsurprisingly, the Note 8 runs Android’s latest 7.1 Nougat OS, with Samsung’s TouchWiz UI skin over the top. Fans of voice control can rejoice, too. As expected, Samsung confirmed that the Note 8 features Bixby, Samsung’s voice assistant rival to Apple’s Siri and Amazon’s Alexa, which debuted in the Samsung Galaxy S8 and S8+ smartphones earlier this year. Samsung also revealed that Bixby will work with Spotify later this year - expect further details on that in October. Elsewhere, the Note 8 also has 6GB RAM and 64GB storage onboard, with a microSD slot for expanding that further. The unremovable 3300mAh battery is slightly down from the Note 7’s 3500mAh, but we doubt many will care as long as it’s reliable. Had it not been tragically blighted by its battery, the Galaxy Note 7 would’ve been an excellent smartphone. Will the Galaxy Note 8 be the U-turn the range needs? Priced at £870 in the UK – making it one of the most expensive Android phones on the market – it will certainly need to be mighty impressive. 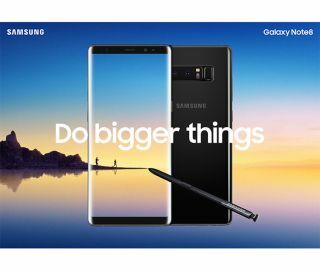 The Samsung Galaxy Note 8 is available in midnight black, maple gold, orchid grey and deep sea blue, and will start shipping on 15th September, complete with AKG headphones that, yes, will plug into the Note 8’s standard headphone jack. Hooray. No headphone port on iPhone 7 "confirmed"